I am still amazed at what a powerful tool Google Analytics is – and the fact that it’s available to online marketers for free. Today I’d like to talk about how to leverage this amazing power for your landing pages, and how it’s important – no, critical – to your landing page success. Google Analytics was first introduced in November of 2005 after Google acquired Urchin Software Corporation. They built the program on top of the Urchin on Demand service (if you've ever seen the initials UTM in any Google Analytics tracking code, that stands for Urchin Tracking Module). Google Analytics has quickly become the most popular website and web traffic analytics tool, and is used by 55% of the top 10,000 websites. And I repeat, it’s completely free. Brian Massey, in his superb book “Your Customer Creation Equation,” says that in order to measure the success of the conversion action on your landing page, you must set up tripwires. Tripwires help us measure when somebody has taken a conversion action on our landing page. A conversion action is typically when somebody fills out a form on our landing page, or when somebody goes through an ecommerce checkout process. Massey explains that by tracking visits to the “thank you” page, you can determine your conversion rate as well as your abandonment rate. But what about multi-step forms? Massey says that measuring the abandonment rate, which is the inverse of the conversion rate, helps you to measure the effectiveness of multi-step forms, such a during an ecommerce process. But the good thing is, you don’t have to track conversions through multiple pages by yourself. 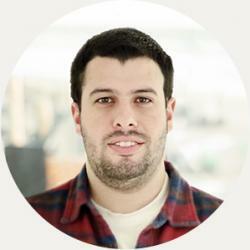 Google Analytics can do the job for you. That’s where the feature called “Funnels” come in. Whether you want to set up a “thank you” or “receipt” page as your goal, or you’d like to set up a complete funnel to track how far your visitors get in your multi-step form, it’s not that hard to set up. Step 2 Click “Create a Goal” and follow the step-by-step process to set up the goal, making sure to use the URL of your “thank you” page. For more information, check out the Google Analytics tutorial on how to set up goals. Step 3 To set up multi-channel funnels, click on the multi-channel funnel tab in Google Analytics. You must have goals set up before getting to this part. Step 4 Start viewing your report! Some of these additional points I’m about to mention helps to drive home how powerful Google Analytics is. The Language and Location info can help you target your landing pages to the type of visitors you’re getting. Are you seeing an unexpected trend of visitors from Brazil? You might want to create a Portuguese language landing page. This can tell you whether your landing page is really engaging site visitors. Pay special attention to the new vs. returning stats. If your returning stats are low, maybe you need to tweak your landing page copy to make it more interesting. You’ll start to see numbers growing in this category, especially with the explosive growth of tablets and smartphones. If you’re seeing more than 20% of your visitors from mobile, you should seriously consider optimizing your landing page for that channel. Finally, you need to look at where your visitors are coming from. This may not be necessary if you've created a landing page for a specific platform, such as Email or Pinterest. But if your landing page is a stand-alone landing page, your traffic sources can tell you whether you’re getting more direct traffic, referrals or if Google is sending you lots of search engine traffic. Google Analytics provides you with a wealth of information – I recommend exploring all the nooks and crannies to see what nuggets of information you have access to. Let’s get practical. 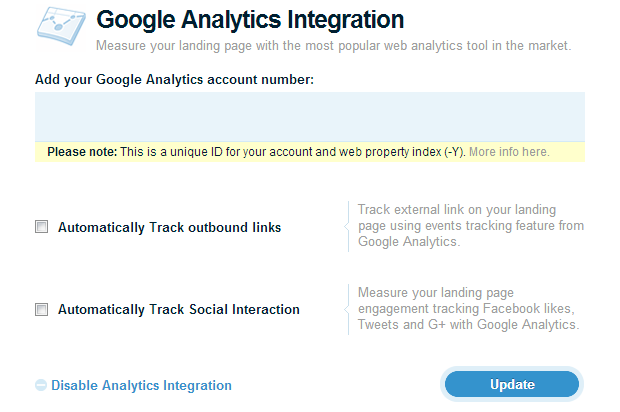 If you were to build your landing page with our own platform, integrating Google Analytics couldn't be easier. After you sign in to your account, you’ll be directed to the Lander dashboard. If you haven’t created a landing page yet, go ahead and do that now. Go ahead, I’ll wait. When you’re done, just click the blue “Update” button and you’re set! The option will turn green, which means everything is set up.